With the cooler season upon us, I thought of sharing some of my favorite soup recipes..the ones I have tried and tested last winter and are going to be repeated this season too! We almost have a couple of avocados in the fridge every week 'cause well, we both are crazy guacamole (guac) fans! yes, we have guac n chips almost every weekend. A spicy creamy guac n chips is definitely our go-to snack for a movie night. The best part (of course, for me) is that hubs is more than happy and loves to make guac. This means I get a day off from the kitchen! Win-win scenario, won't ya say? :) So there you have it; it never crossed my mind to try another recipe with avocados. But once upon a time, there sat a lone avocado in the veggie drawer of my fridge and it dawned up on me - hey now that a 2-person bowl of guac is not possible, why not google a nice recipe that I can try with this avocado? So, that's how I discovered this healthy soup, which goes perfectly with our 'salad-dinner' nights. The soup is a quickie - takes less than 30 mins to whip-up and no cutting-shutting required, so that qualifies as a keeper in my weeknight dinner books. 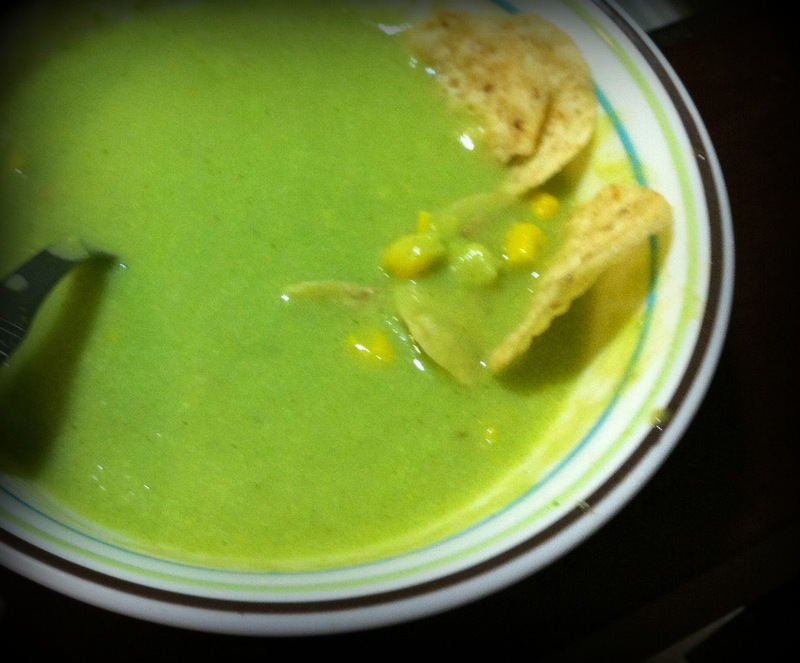 The soup can be spicy (with green chilies) and tasty (garlic and fresh coriander gives it a nice aroma) and the corn kernels provide an interesting and flavor and texture contrast to the velvety soup. Avocados are rich in proteins, beneficial fats, Carotenoids (i.e. high quality source of Vitamin A) and has heart healthy and anti-inflammatory properties. No wonder its termed as a healthy super-food! Like most of my recipes, I have adapted this one from here. 1. Halve the avocados, remove the pit and peel. 2. Blend them by adding water (you can use vegetable stock for added flavor), lemon juice and salt in a blender until smooth. 3. Heat oil in a medium saucepan, add garlic and sauté for a minute and add the avocado mixture and mix. 4. Add corn and cook on medium heat until just steaming. 5. Season with salt and pepper powder. 6. 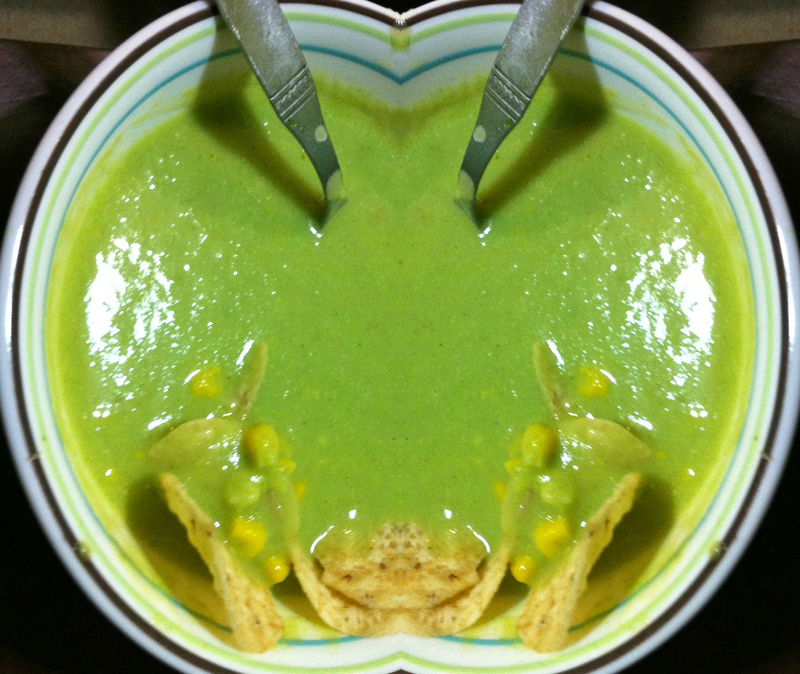 Garnish with coriander leaves and tortilla chips and serve hot. Superb recipie! can't wait to try it out! Wow. I'm definitely going to try this soon. I love avocado too but don't know what it tastes like warm. This looks delicious.